Do some of the contacts on your Samsung Galaxy Tab have pictures associated, while others do not? Well, you can add your own images to those contacts that don’t have them yet. 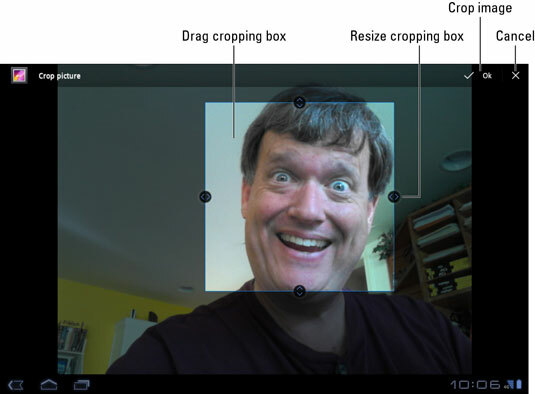 The simplest way to add a picture to one of your Galaxy Tab contacts is to have the image already stored in the Tab. You can snap a picture and save it, grab a picture from the Internet, or use any image already stored in the Tab’s Gallery app. The image doesn’t even have to be a picture of the contact — any image will do. Locate and display the contact’s information. Touch the Edit Contact icon button. Touch the Contact Picture icon. Choose the option Select Photo from Gallery. If you have other image management apps on your Tab, you can instead choose the app’s command from the list. The photo gallery is displayed. It lists all photos and videos stored on your Galaxy Tab. Browse the photo gallery to look for a suitable image. Touch the image you want to use for the contact. Touch the Done button to finish editing the contact. The image is now assigned, and it appears whenever the contact is referenced on your Galaxy Tab. You can add pictures to contacts on your Google account by using any computer. Just visit your Gmail Contacts list to edit a contact. You can then add to that contact any picture stored on your computer. The picture is eventually synced with the same contact on your Galaxy Tab. If the contact is in your presence, you can always take her picture using the Galaxy Tab. After Step 3 (above), choose the command Take Photo or Take New Photo. Pictures can also be added by your Gmail friends and contacts when they add their own images to their accounts. Some images in the Gallery app may not work for contact icons. For example, images synchronized with your online photo albums may be unavailable. To remove or change a contact’s picture, follow Steps 1 through 3 in the preceding list. Choose Remove Photo to get rid of the existing image.